MetLife Poll Asks Who’s Safer on the Road: Men or Women? A new poll from MetLife Auto & Home probably won’t end the age-old debate over which gender has the better drivers, but it shows that women at least think they are safer than men behind the wheel and that about a quarter of men agree. Fifty-one percent of female respondents said they considered themselves safer drivers than their male counterparts, while a mere 39 percent of men believed they were less risky, according to survey results released last week. And while 35 percent of males said they were unsure who was safer on the road, only 24 percent of women were similarly undecided. Male drivers could boast a firmer grasp of recent technological innovations designed to protect motorists, according to the poll. Men were more than twice as likely, for example, to have knowledge of electronic stability control (ESC) systems, which use computer-controlled braking to reduce the risk of rollovers and other crashes. Fifty-eight percent of males polled were familiar with ESC, which automakers are required by federal regulations to include in all cars built after Sept. 1, as compared with 26 percent of females. 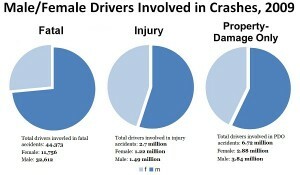 Federal officials say men are involved in vehicle crashes more often than females. In 2008, licensed male motorists were involved in crashes that caused death, injury and property damage at a 37 percent higher rate than their female counterparts, according to U.S. Department of Transportation statistics. 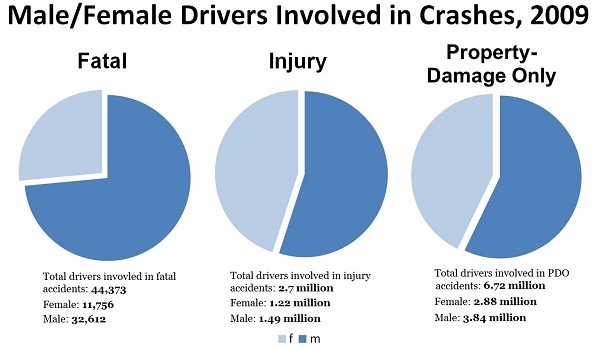 The disparity was greater when limited to fatal crashes, with drivers involved in those crashes being more than three times more likely to be men than women. Because of these trends, most insurers in the country provide women with greater access to low cost car insurance policies compared to men with similar driving records. An analysis of quotes from about a dozen California insurers earlier this year showed that men could expect to pay about 20 percent more for coverage compared with women. At least five states prohibit insurers from using a policyholder’s gender to help set rates. According to the MetLife poll, men and women largely agreed when it came to the high-tech safety and other features they wanted on their next vehicles, with more than 80 percent of all respondents saying they would pay extra to have technological upgrades. Fifty-seven percent of female motorists and 53 percent of men said they would prefer a vehicle with the latest high-tech upgrades, with 60 percent of women desiring forward-collision warning systems as compared to 53 percent of men. Rear-view cameras were eyed by 58 percent of women and 53 percent of men, and GPS was something 65 percent of women and 61 percent of women said they wanted. The survey did not address which drivers were more likely to ask for directions. To find out how policyholders rank MetLife and other companies in terms of claims, rates and service, readers can research user-submitted car insurance reviews online.